As we head into November, I am always mindful of Thanksgiving. There are so many blessings in my life, including my family, my friends, my health, my home, my readers (that's you! ), and the incredible opportunities my blogging offers me. I'm also thankful for all the wonderful sponsors who offer fabulous prizes to my readers! 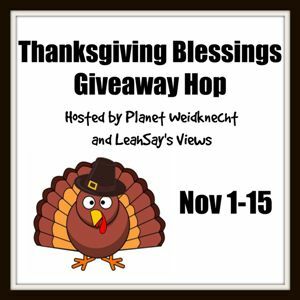 The Thanksgiving Blessings Giveaway Hop is a fabulous way to find holiday gift ideas and win prizes that would make perfect presents for you and your loved ones. All the bloggers listed at the bottom of this post are offering giveaways and you can enter to win great prizes on every blog! My passion for the beach can easily be spotted in my master bedroom. My decor is covered with palm trees, so shooting some amazing palm tree photographs when I was on the island of Nevis was a dream come true. Every time I look at this print, it makes me feel like I'm still standing on that beach with the sea breezes blowing through my hair. 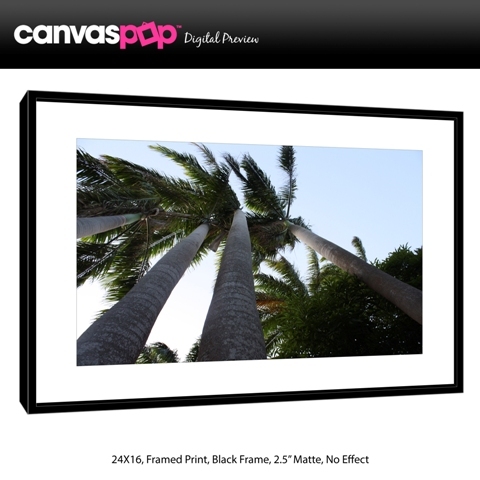 CanvasPop took my favorite palm tree perspective shot and turned it into a gorgeous framed photo print! CanvasPop printed my favorite photo on fine art paper and framed it in a black wood frame with a white mat for extra effect. There is even a piece of glass in the frame that will protect my beautiful shot. I am simply beside myself with joy! It is gorgeous and I'm extremely impressed with the quality. It's so easy to do...just send them your favorite photo and they will enlarge it, frame it, and send it to your door. It was packaged incredibly well, with bubble wrap and cardboard to protect it during shipping. It arrived in perfect condition and ready to hang with a wrapped wire already attached to the back. The photo print is crisp and clear. I highly recommend CanvasPop! Visit CanvasPop.com for quality art and home decor that you will be proud to hang in your home. They'll do amazing work with your photographs. They also offer canvas printing and a 100% satisfaction guarantee for life. A framed print is a great holiday gift idea too! DISCOUNT CODE for my readers: You can save 35% off your entire order by using the discount code WEIDKNECHT35. This discount code expires on November 30, 2015, so order today! Win a 16x20 Framed Photo Paper Print with a 2.5" white mat! To enter, just fill in the giveaway form below. The giveaway is open to readers age 18+ in US, CAN, and EU. Giveaway ends on 11/15/2015. Good luck! your order of $50 or more. That is a deal for a Christmas present! I like the Word Art Maker to personalize a photograph. I learned that they offer a 100% “Love it” guarantee for life! I learned that you can print directly from Instagram! I love their photo mosaic and photo collages. I love that you can make photo mosaics on their site! They have very unique items that I've never seen on other photo sites before! I learned that their canvas prints and framed prints are handmade by real people, so someone is visually reviewing the work. I learned that their canvas frames and prints are made by real people hand made. I learned that you can add filters and effects to your pictures! I like the 100% "Love It" Lifetime Guarantee. Best quality canvas printing anywhere! I love that they are handcrafted by real people!! I learned that they have 100% “Love it” guarantee for life! I really like that! They give you free printed proofs!! I learned that CanvasPop adjusts the contrast and color to the pictures at no additional cost. I love the photo mosaic. Would be beautiful to have one of those of our family hanging on the wall. I learned that if you don't love your product that will reprint it or refund you. I like that you can print a instagram photo to canvas! Thank you for the chance to win! They have a ton of cool products! I would love to try the Word Art Maker sometime! I really like that they do triptych art. I learned they have a 100% guarentee! That they allow you to print directly from Instagram that is so convenient. I learned the prints are handcrafted as well as the frames. That means better quality in my eyes. i learned Any image, any size or resolution. Upload from your computer or directly from Instagram or Facebook. Works with almost any size image! I really like the 100% “Love it” guarantee for life! I learned that you can use instagram. I love that they are hand crafted. I like that they have a 100% “Love it” guarantee for life! I love their canvas prints and would love to have one! I learned that they offer panoromic photo prints. I learned that they are the webs #1 choice for quality canvas printing and framed prints. You can use their filters on your photo to get the color just right. I learned how they have $30 off current orders. I learned that they offer a 100% “Love it” guarantee for life, love it! I learned that CanvasPop provides the highest quality canvas photo prints anywhere. I would love to try the Word Art Maker. That could be pretty handy. I learned that you can print directly from your social media page - gotta love that! I like the photo mosaic you can make! I know my teen daughter would adore this for her room...so many fun photos with friends she'd like to frame...this would do it all! I learned that their customers have rated them 4.7 out of 5 based on 12,335 reviews. I like the panoramic photo prints! I love that you can create a photo mosaic. I learned that this company has a 100% "love it" guarantee. I am loving the 30%off right now! I learned that they have a love it guarantee (AWESOME!!!) and that you can use photos from your Instagram, pretty cool !! They can print directly from Instagram. I learned that I could print directly from Instagram! That is where my favorite photos are! So good to know! I love the Word Art Maker! I learned that you can get free digital proofs. I learned that their products are made in the USA! Love the 100% guarantee for life. I like that all of their prints are hand stretched onto frames that are hand made. That's cool! I learned that they can create a customized piece of art from the prints you provide. I learned that you can make a single print or collage, and add text and shapes. I learned that they have a 100% love it guarantee for life. That's incredible. I love how easy it is to print photos to a canvas! I use Instagram and FB all the time for photos, this is a nice compliment to that! I learned that a 10" x 10" canvas is $37.00. I learned that you can create a collage too. I also learned that there is a guarantee. I learned that you can print directly from your facebook pictures. That's a huge help for me. I like their prices....pretty reasonable. I learned that you can use your Instagram photos. I like that they have a "100% “Love it” guarantee for life!" I love that they can print any picture and send you a free digital proof. Nice! I learned that they guarantee their work 100 percent. To me that says and means a lot. They work with you through the process. I learned that they have a 100% Love it guarantee and that is awesome. You can customize everything including the frame. Free digital proofs. 100% guaranteed. I like to 100 lifetime guarantee. I like that they have 100% “Love it” guarantee for life! I learned that they are handcrafted and you can use all types of pictures. These are great. You can print directly from instagram. I just love the variety of ways I could have the painting on canvas! I would love to make a photo collage! I love that real people work on these, so you are getting a personal touch and attention to detail. I like that they have a new Word Art Maker! I learned that they have a lifetime 100% Love Guarantee. I learned they offer a 100% satisfaction guarantee on their products. I learned that CanvasPop has the best quality canvas printing anywhere with the best in quality framed prints and also great customer service.